Stop sending the same email to everyone on your list. It's so much better to receive email with personalized content. Being thoughtful is a great way to build a relationship with your subscribers. Let's say a visitor was looking at jeans yesterday. Shouldn't your next email to them contain jeans? We only send emails with relevant content. In this case, she was looking at furniture to the living room the other day, and he was looking at kitchen products. We send them completely different emails. We have 3 email campaign types based on specific events. Using events makes our emails very context specific so your visitors understand why they received it. For instance: maybe they searched for something on your website and left. This is a great time to email them with product suggestions related to their search term from your store. Product recommendations based on trends, new products and products they viewed recently. Show product recommendations based on their last search. Filter promotions based on what the user is most interested in. 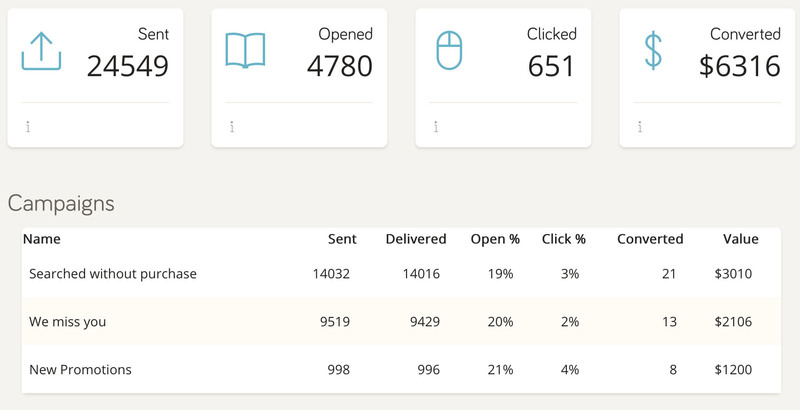 At any time, you can see how your email campaigns are performing from your DataCue dashboard. We'll show you how many were sent, opened, clicked and how much revenue each campaign made for you.